In today’s world, people often wonder, “Who is God?” The next questions that often come up are: Does He know me? Do I matter to Him? These are age-old questions, and really the questions of life. If we know the answers to these questions, then we can put our life on earth into perspective. As a member of The Church of Jesus Christ of Latter-day Saints, sometimes inadvertently called the Mormon Church, I believe that God is my Heavenly Father. In the Articles of Faith (13 points of belief that outline basic teachings and ordinances in the Mormon Church), the first one is: “We believe in God, the Eternal Father, and in His Son, Jesus Christ, and in the Holy Ghost.” They are three separate and distinct beings. I am Mormon, but I went to a Lutheran preschool, where we said the Lord’s Prayer at snack time. In the Lord’s Prayer, Jesus Christ teaches us how to pray—which is the way we communicate with God. There are many lessons in the Lord’s Prayer, starting with how He begins His prayer (Matthew 6:9). Of all the names, titles and/or descriptions Jesus Christ could have used in teaching us how to address God in our prayers, He chose the name “Father.” The term “Father” implies a familiarity and connection more intimate than simply “God.” To me, using the word “God” puts distance between me and Him, because He is a Perfected and Glorified Being and I am flawed and imperfect. But using “Heavenly Father” makes Him seem more approachable and loving, like my own earthly father. Of the many magnificent purposes served in the life and ministry of the Lord Jesus Christ, one great aspect of that mission often goes uncelebrated. … It is the grand truth that in all Jesus came to say and do, including and especially in His atoning suffering and sacrifice, He was showing us who and what God our Eternal Father is like, how completely devoted He is to His children in every age and nation. In word and in deed Jesus was trying to reveal and make personal to us the true nature of His Father, our Father in Heaven. In that sense, Jesus did not come to improve God’s view of man nearly so much as He came to improve man’s view of God and to plead with them to love their Heavenly Father as He has always and will always love them. The plan of God, the power of God, the holiness of God, yes, even the anger and judgment of God they had occasion to understand. But the love of God, the profound depth of His devotion to His children, they still did not fully know—until Christ came. So feeding the hungry, healing the sick, rebuking hypocrisy, pleading for faith—this was Christ showing us the way of the Father. … In His life and especially in His death, Christ was declaring, ‘This is God’s compassion I am showing you, as well as that of my own.’ In the perfect Son’s manifestation of the perfect Father’s care, in Their mutual suffering and shared sorrow for the sins and heartaches of the rest of us, we see the ultimate meaning in the declaration: ‘For God so loved the world, that he gave his only begotten Son, that whosoever believeth in him should not perish, but have everlasting life. For God sent not his Son into the world to condemn the world; but that the world through him might be saved (John 3:16-17). God is our Heavenly Father. He loves us and wants us to seek Him. He wants us to come to Him in prayer and supplication. He knows us—He knows us each by name—and He wants us to come to know Him. Heavenly Father has given us the tools and the means by which to find Him, but we must do our part by coming to know His Son. I love Elder Holland’s message of one of the Savior’s greatest and often least understood missions—to help us know the true nature of His Father, our Father in Heaven. “God, in His ultimate effort to have us know Him, sent to earth His Only Begotten and perfect Son, created in His very likeness and image, to live and serve among mortals in the everyday rigors of life,” Elder Holland said. I have a picture hanging above the mantel in my living room of the Savior, Jesus Christ, sitting with a group of children. There is an expression of love and tenderness in His face, and peace, love and happiness on the children’s faces. Also on my mantel is a statue of the Christus, Christ with His arms outstretched, inviting me to come unto Him. So when we look at the Savior, we see the love of our Heavenly Father through the Son, Jesus Christ. What a powerful thought! We have a visual manifestation of our Heavenly Father’s love through the images of His Son, Jesus Christ. We can know of Heavenly Father’s true nature by studying the life and teachings of His Son, Jesus Christ. 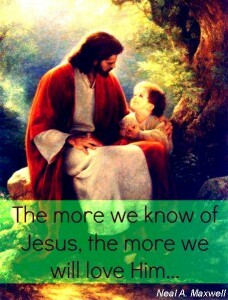 When we realize the depth of our Heavenly Father’s love for us, we realize that He knows us, and we matter to Him. When we know that our Heavenly Father cares, we know we can trust Him and His plan for us. And, for me, this knowledge helps me to feel that God isn’t so far away after all.